KONG Fire Hose Sqwuggie Small is a great fire hose squeak and tug toy. 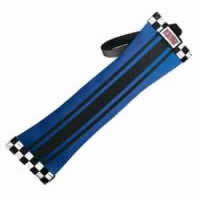 Great for water games with small dogs because the fire hose is water resistant and doesn't go soggy. You can wash them in the sink using a little soap and water to get the day's dirt off. Fire Hose dye may run or bleed. Best if used outdoors or on washable surfaces. Excellent for tugging, training and fetching. Durable fire hose material for long-lasting play.